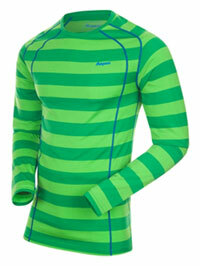 The Fjellrapp Long Sleeve shirt is one of the items in Bergans' new undergarments range. It has long sleeves, a round necked top and is what is euphemistically termed an 'athletic' fit i.e. it is relatively close fitting and touches you absolutely everywhere. It's made from pure merino wool which is very soft to touch. The knit is even throughout - there are no lines or ridging - and the overall finish looks of a high quality. Once on, it's extremely comfortable with great length in both body and sleeves. The Fjellrapp is classed as Lightweight by Bergans and I've been wearing this as a base layer with a (Bergans) midlayer plus an outer shell in temperatures of about 4-5 deg C. It's kept me extremely comfortable both during rest breaks and during higher energy periods - the wicking is excellent. Even after several days walking over a variety of Lake District fells there is virtually no odour retention at all. This Fjellrapp will definitely now feature in my standard kit list! For merino wool fans, the Fjellrapp Lightweight is a great option as a multi purpose base layer - it has excellent wicking combined with great warming properties. Light weight enough to carry with you just in case you need additional warmth. Also great as nightwear for those unexpected cooler nights camping under the stars.